Shenanigans are afoot in the Secret World on April First, sweetlings! Secret World Legends has received an update with some particularly obscure patch notes. Truth has been hidden within jokes! What's real and what's fake need be discovered by players! We're working hard to figure out the reality of the patch. The following patch notes have been revealed to have truth to them. A new mission has been added that can potentially reward the Tank Commander Blade and Depleted Energy Cell: Once More Into the Tower! This mission can be found by acquiring the Peculiar Box, a random drop from Reward Bags such as Talisman, Weapon, or Glyph Reward Bags from a variety of mission content going from the Scorched Desert all the way to South Africa! Shambala included! Be warned, however, as this mission can prove a difficult fight! The Tank Commander Blade and Depleted Energy Cell are both Museum items for the Museum of the Occult. A walkthrough will be made available as soon as possible! The Release Dove pet's source in the Pet Window previously said it was from Jack Venture, which was false. The pet's true source is from the Tree Tender during the Valentine's Day Event. The Release Dove's source has been updated to match. There is a new pet: A Glaring of Kyats! This pet's source is listed as "???" and is a reference to player Kylaney, a cat lover. We do not yet know the method of obtaining this pet. We're on the hunt! UPDATE: We now know how to get A Glaring of Kyats! Use the [Kyat Key Card] on a special hatch in the Dracula's Castle instance to enter a special zone called "The Kyastle" and try your chances at a whole new mission: Extra-Dimensional Furry Friends! This mission can only be attempted once every 18 hours regardless of your patronage status regardless of whether you succeed or fail in it's timed challenge goals! That's right - a timed challenge! Collect 50 Kyats within 4 minutes in order to successfully complete this mission and receive A Glaring of Kyats! The [Kyat Key Card] is obtained from the special guest "Crazy Kyat Lady" in the Rosenbrawl, who has a chance to spawn after at least 10 deaths have occurred in the Rosenbrawl. The Occult Defence Achievements "Repairs Not Needed" and "Structural Inspector" were previously being rewarded for completing 3 consecutive waves at 100% Integrity instead of 10%. These achievements should now behave properly. Shambala team size has been reduced to 5 from 10, making Shambala a match of 5v5 as opposed to the original 10v10. This should allow Shambala to pop more frequently than before! Shambala has new rewards! We're still learning more! There's a new PvP minigame: The Rosenbrawl! Players invite other players! The first mission after receiving an SMS invitation is The Rosenbrawl, which unlocks The Rosenbrawl! Completing The Rosenbrawl will then unlock the missions Martial Combat and A Pugilistic Welcome. Completion of those two missions will unlock the mission A New Contender, which is what will allow you to invite another player to the Rosenbrawl! Be warned, though - you can only complete A New Contender once in a long while! There's undoubtedly going to be bugs, big or small, in any update bringing in new content. So far, there hasn't been anything particularly jarring or noteworthy. We will update information listed here with greater clarity as new content is further understood. You can read the whimsical patch notes for the Shenanigans Update HERE! Any information proven to not be part of the April Fool's Day whimsy will be added to this post! Posted by vomher on March 24, 2019. Last updated by vomher on March 24, 2019. The Equinox looms; it's time to help the Envoys of Avalon! With their barriers at their strongest with the height of the equinox, the Druids of Avalon leave their hidden lands. From within the Holllowed Halls of Agartha, they beseech any Secret Worlder willing to aid them in preparing for any occult disaster that might strike their beloved Stonehenge. To help the Druids, go to the Seed of Life in the Hollowed Halls of Agartha and speak to representative Fearghas Abernathy (565,190) to take his mission, which will require waves of Occult Defence Scenarios be completed. Let us shed some light on everything the Druids have to offer during this biannual phenomenon with our Envoys of Avalon event guide! Check there for even more in-depth information on what the Envoys of Avalon consists of as well as a basic description of the Occult Defence scenario! If you haven't done the Occult Defence Scenario since the last equinox or earlier, you may be unaware of what changes and new mechanics have occurred. Our post detailing Update 2.3.1 summarizes what was added! The Druids aren't the only thing to return with the Equinox - the Infernal Cache is back! See more of what this Cache has to offer here! There's still time to help the Envoys of Avalon - don't wait until it's too late! Posted by vomher on February 28, 2019. Leaderboards have come to the Secret World! Are you the top of the top, sweetling? The long-awaited leaderboards currently keep track of not only monster kills aplenty, but also Stonehenge statistics such as total Occult Defence scenarios completed, total number of waves completes, highest wave reached, and longest streak of waves completed in a single scenario - and this is only the beginning! Check out the Secret World Legends Leaderboard and find where you stand! A special Patron purchase bundle is now available for a limited time! Twelve months of Patron alongside exclusive items and cosmetics - and it's not swamp gas or a weather balloon! The 12-Month Patron Bundle is available for a limited time! This bundle contains 12 months' worth of Patronage, an entire clothing set called the "Secrecy Enforcement Agent" set composed of five pieces of clothing, the GLIDR sprint, and the Hypnotic Memory Surpressor gadget, which looks like a neuralyzer and behaves as an aggro-wiping gadget. 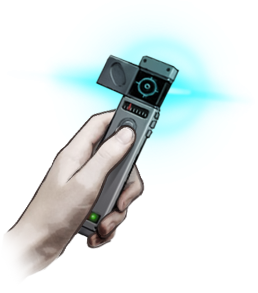 Hypnotic Memory Surpressor - A gadget capable of acting as an aggro wipe toward enemies, excluding bosses or other players. "Wipe the short-term memory of nearby enemies in front of you, making them forget that they were fighting you. Does not work on boss or player enemies". GLIDR - A segway sprint that leaves a neon blue trail wherever it goes! GLIDR stands for "Gyroscopic Lightweight Intuitively Driven Robot". See TSWDB's GLIDR page for an image of it! The bundle can be purchased for $99 by all players, be they current Patrons, Lifetime Patrons (Grandmasters), or not currently Patrons at all. At this time, the bundle price is consistent regardless of what membership type the buyer holds. Grandmasters, should they purchase the bundle, will receive the gadget and cosmetics but not additional patronage, as they are already perpetual patrons. 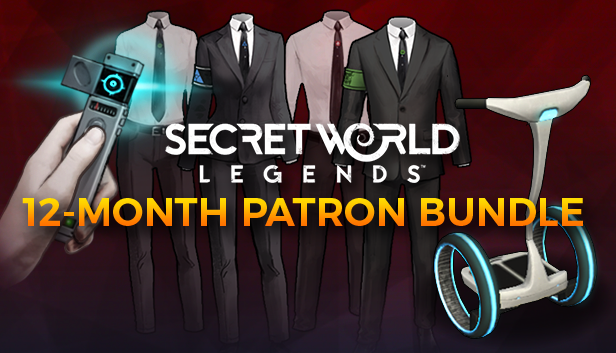 The Limited-Time 12-Month Patron Bundle can be purchased either through clicking the GLIDR-shaped icon on the top-bar in-game or if you have Secret World Legends through Steam, through the Steam store page for the 12-Month Patron Bundle DLC. Check out the official news release of the bundle here! Love is in the air of the Secret World! Can you feel it, sweetlings? Secret World Legends' Valentine's Day event is here! From 8 February 2019 to 15 February 2019 and now extended to the 19th, Valentine's Day is a time of love and commercialism rolled all into one. During Valentine's Day, players can not only purchase a series of seasonally appropriate cosmetics from the Dressing Room, all marked with a big red heart icon, but they can also buy Bags of Saint Valentinus and other items from the Tree Tender in Agartha (560,180) for Third Age Fragments! Bags of Saint Valentinus, when used, gift the user and up to 10 surrounding players with unique Valentine goodies. When you spread the love with your first Bag of Saint Valentinus, you receive the title "Cupid's Accomplice", too! Those struck for the first time by another's Bag will gain the appropriately named title, "Love Struck". All characters received a Bag of Saint Valentinus in their /delivereditems on the 7th as a prelude for the event. The free Bag exists in /delivereditems for only five days - if not claimed before that time, the free bag will vanish! For complete information on what Valentine's Day entails for the Secret World, check out our Valentine's Day Event Guide!